The Line Prophet 100 is no longer. Last year Line added Early Rise and an all new Capwall Construction!! Both of these changes makes the 2012 and 2013 Line Prophet 98 Skis some of the most versatile All Mountain Skis on the mountain. The slight tip rocker allows this ski to get edge to edge unlike a ski with out tip rocker. You wont even notice this ski is almost 100mm under foot. These skis are designed for skiing everything on the mountain. If you find yourself tending to go in the woods more than anything then you will want to look at the all new Line Influence 105 Skis or if you enjoy wide like I do the 2012 Influence 115 or 2011 Prophet 115 (2013 Line Influence 115 is much more Big Mountain Oriented) is one of my favorite skis. You can take the Line Prophet 98 anywhere on the mountian with confidence that you have a ski that will handle the conditions at hand. They enjoy speed on those fast groomer days when it has not snowed in a few weeks and yet when it does snow they float wth ease thansk to the Early Rise. For the masses the Line Prophet 98 Skis are going to be an easy go to ski no matter which coast you live on. With a 17.2m turn radius in a 179cm length you can see why many Volkl Mantra owners have started to make the switch to Line Skis and with a Fatty Base & Edge you are know they are going to have incredible durability. Don’t be afraid to buy long in this ski as they measure short and the tip rocker makes them ski even shorter. If you are looking for a one ski quiver around 100mm then look no further than the Line Prophet 98 Skis for 2012. If you do not enjoy rocker yet and are still not ready to change then you can still find some 2010 and 2011 Prophet 100′s on the market. It doesn’t take long to immediately see that the all new 2013 Line Influence 115 Skis have been totally changed from the 2012 version and the 2011 Line Prophet 115. The 2013 Line Influence 115 skis are much more true big mountain skis. They always want to be facing down the hill and enjoy high-speed rides down anything including big drops. The all new redesigned tip profile on the ski make skiing big mountain lines a dream and will plow through anything at whatever speed you can throw at it. Both the tip and tail have become narrower making big mountain turns more easy. If you are truly looking for a big mountain ski with lots of energy then the 2013 Influence 115 Ski is your ski. However, if you are looking for something more versatile in a variety of conditions say some big mountain lines, but also a lot of inbounds groomers and resort skiing then you may want to consider the 2012 Influence 115 skis or the 2011 Line Prophet 115 Skis. These skis have a quicker turn and are much more All Mountain/Freeride oriented skis rather than Big Mountain like the 2013 Line Influence 115 Skis. If you want something that you feel comfortable taking anywhere on the hill in any conditions go with the older versions, but if you are skiing big mountain or big snow or chop the 2013 Line Influence 115 skis will excel in those conditions. For 2013 Line Re-Designed the Line Influence 115 to more of a true Big Mountain Ski. The turn radius is now bigger and made for more straightening than the 2012 Influence 115. Another major change besides the shape is the If you want a super quick turning ski for groomers and powder go with the 2012 Influence 115 or the Prophet 115 from 2011, if you want more of a Big mountain ski that will plane through deep snow and not plow and bounce then go with the all new 2013 Line Influence 115. The metal matrix is now flat into the ski and not on top like before and this helps save weight . Line has really found a way to improve a ski that I already used as an everyday ski. The energy you could get out of the ski was amazing and good form them for dropping the 172cm length and adding the 192cm length. These skis because fo the Early Rise in the tip and tail ski very short so you need to go longer to get the correct length for you. Also, you can really feel the active edge when you are on groomers getting back to the lift and that is the big difference I have been finding with many of the Line skis compared to others is that they ski very short but yet you feel like you are using the whole ski. The new tip and tail design also will take a skin clip easier for more backcountry adventures. If you are looking for a big mountain ski with versatility the Line Influence 115 should be in your top 3 for 2013!! Again for 2013 Line Skis has done an amazing job with the Sir Francis Bacon. It comes back for 2013 with an updated graphic which is another piece of art by the master Eric Pollard. I didn’t think that Line could do a better job with the graphic and I was wrong, Eric really put some amazing color into the ski and the graphic has been getting amazing reviews. Now to the skiing. I said it last year and I will say it again this year, if you are looking for a one ski quiver ski that is playful and wants to always be searching out for the terrain off the trail then you will be very hard pressed to find anything more versatile in the 100-110mm category than the 2012/2013 Line Sir Francis Bacon Skis. Other companies seem to always be playing catch up with Line and with the Early Rise/Early Taper on both the SFB and Opus Skis it is easy to see why! They turn on a dime with no effort at all, yet when you need stability on groomers the Line Sir Francis Bacon really holds on edge and with a turn radius of about 17m you will think you are on a ski 90mm in the waist. The Bacon allows you to easily get in and out of turns quickly and playfully. If you are like me and enjoy skiing the side 10 feet of the trail in the crud and sugar snow the Sir Francis Bacon eats those conditions up with ease! With the Early Rise and Early Taper the ski has a surf like feel to it and will easily ski all conditions that you throw its way. 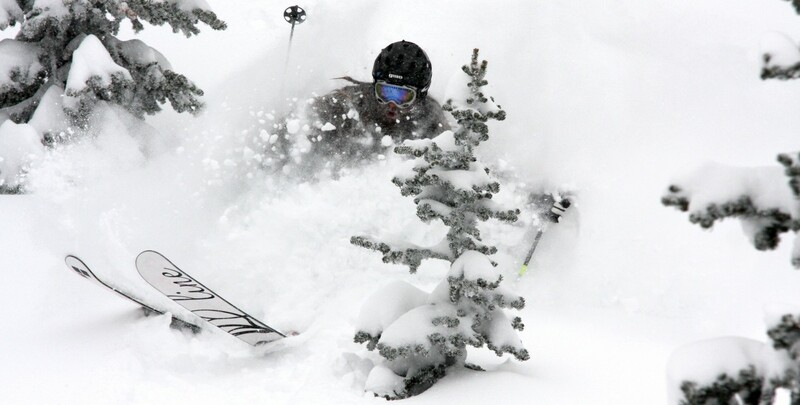 If you are into skiing pillow lines and searching out deep snow you can ski the Bacon, but you may want to look at its big brother the Mr. Pollard Opus for true powder lines in the backcountry. One major factor you need to consider when buying this ski is the length. These skis not only measure short but they ski short as well. The one thing that is need with the Sir Francis Bacon is a 190cm length ski. This would make decisions much easier. The 184cm length is the top selling length and when you get on it you will see why. It turns like a 170cm length ski and sometimes you forget that you have a ski on that is over 180cms. For bigger guys and more aggressive skiers I think a 190cm length would be a great addition to the line up. If you are over 220lbs you may want to consider something slightly longer like the Mr. Pollard Opus. Just don’t sell yourself short, these skis may be 108mm in the waist but you still want the length to truly get all optimal ride out of this ski. If you are over 160lbs you should be skiing the 184cm length. As for mounting point I would really suggest the Mid Sole mark that Line has already suggested. The skis do ski the best mounted on that line and if you are a tele skier I would really suggest talking to whoever is mounting your bindings and make sure they mount them so your boot mid sole is around the mid sole mark on your boot. These do ski best toward center even on a tele set up. I look forward to getting out this weekend on the Bacon’s again and see how they perform on true firm Northeast snowpack! Please feel free if you have any questions to post them here and I will do my best to get back to you in a timely manner. Although it is February the weather and snow feels more like April so i have been getting out on the hill and testing as many skis as possible so look for more reviews to follow. The 2013 Line Prophet 98 and 90 come back with an updated graphic but the same ski. The jury is still out on the 2013 graphic on the Prophet series, they look good but maybe not as strong as they have in the past. Prophet 85 is an all new Prophet that comes with the metal matrix/Capwall and the Prophet Flite is now the Prophet 85 with out metal, no metal matrix, Fibercap construction and Aspen Macroblock core instead of Maple. The Mr. Pollard Opus gets a 192cm length and sick new Eric Pollard graphic. Sir Francis Bacon comes back unchanged except for the graphic. The 2013 Line Influence 115 gets a Capwall construction along with a milled piece of metal instead of a metal matrix and now you will only be able to buy a 179cm, 186cm and 192cm. The 2013 Line Chronic and Line Blend both get a total make over with the Chronic possibly having its best graphic to date. The 2013 Line Afterbang also gets a new size with a 172cm being added to the lineup. Line Skis also are reintroducing the Line Anthem as the Line Travelling Circus Ski. No changes from the original Anthem. People have been asking for it and so now it is back! The women’s line gets new ski called the Soulmate which is replacing the Celebrity 100. It is 98 in the waist and is the women’s version of the Prophet 98. Not a typical Line’s women’s graphic on the Line Soulmate and so far it has been really well received. A new ski called the Celebrity 85 has been added to the line with a 85mm waist with no metal. As for the junior line there is now a 165cm length in the Sir Francis Bacon Shorty and a 100cm and 143cm lengths in the Super Hero and Snow Angel. A review of the 2012 skis is already available if you scroll down through my posts. However, there has been one important change for 2013 and that is the addition of the 192cm Mr. Pollard Opus. Other than a new graphic and a new size the ski stays the same. The Line Mr Pollard Opus has been one of the best-selling skis of 2012 and we expect 2013 to be even better! A few select dealers still have the 2012 Mr. Pollard Opus skis so be sure to get yours today, unless of course you are looking for a 192cm length Mr. Pollard Opus then you will have to wait until the 2013 skis are out! Still one of my favorite skis you can not go wrong, unless you go to short. Here is the review of the 2012 Line Mr. Pollard’s Opus Skis which are the same for 2013, but now with the additional length of a 192cm length!! The Line Sir Francis Bacon or SFB Skis has been one of our favorite skis of the past 4 years. Last year it received tip rocker and the reviews were all for the best!! For 2012 the ski gets a total makeover. Instead of 115mm in the waist the ski is now 108mm and with a totally different profile the ski is actually more versatile then ever before. With an Early Rise and Early Taper that allows the ski to have more effective edge when on groomers the 2012 Line SFB is the perfect one ski quiver ski. If you are looking for just one ski to be able to use in all conditions and terrain the Line SFB is an excellent choice. I tested this ski in multiple conditions and really found that it handled everything with ease. The new 2012 SFB is more responsive then it ever has before and with an AT Binding on it this would make an excellent backcountry setup. The bumps were a ton of fun to do with the new Line SFB thanks to its amazing tip profile and its ability to just absorb each bump. In the powder it floats with ease and snow does not get stuck underneath like it can with some wider skis with rocker that is not well thought out. The past Line SFB was an excellent ski so if you enjoyed that ski dont be afraid to try and find a pair at a reasonable price. Some people just do not enjoy the rocker setup and that is their perogative, I however dont own a pair of skis with out rocker. If you enjoy wider skis the Line EP Opus is the best new ski for 2012!! The Line EP Opus is now my everyday ski and and should be yours too if you enjoy having the versatility of a wider waist. If you want 115+ then go with the Line EP Opus it is going to be hard for you to be disappointed. If you want something for skiing a little bit more on trail then the Line Sir Francis bacon is an excellent call. Most versatile pair of skis I have ever owned is the all new 2012 Line EP Opus skis. The Line EP Opus skis does whatever you want the ski to do in any conditions and terrain. With the float of the EP Pro and the maneuverability of the Sir Francis Bacon the Line EP Opus skis are the ultimate one ski quiver ski. Although the ski is narrower than the EP Pro it still has amazing float thanks to where the Early Taper and Early rise have been located. Eric Pollard designed these skis as his masterpiece and as someone who has not only skied every ski that Pollard has designed but also has been skiing with the man himself he has combined all the best of his creations into this one ski. If you are looking for an excellent AT ski but don’t want the waist width of the Opus then I would suggest the Sir Francis Bacon. If you are looking for a ski to help you poach your favorite places then this is my weapon of choice. It will ski the deepest of powder with ease while attacking the windblown snow with very little effort. 2 places the EP Opus excels in where many others in this 115mm+ waist category does not is on the groomers and bumps/moguls. I was able to make full pull bump runs with very little effort or adjustment. When it came to skiing glades there was no other ski I would rather be on than the Opus. If you are charging hard and enjoy a stiffer ski than you would want the Prophet 115 or Influence 115, but if you enjoy a ski with tons of playful energy and one that just enjoys everything in front of you then the Line EP Opus is a ski that you really should not pass by with out buying. It looks like untracked.com or Al’s Ski Barn has these in stock right no and ready to sell! !